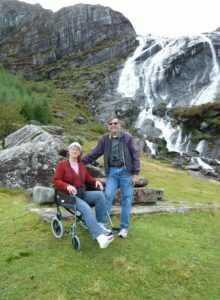 This was to be our ninth pilgrimage to Ireland. But, I was bitten on the foot by a poisonous snake, a copperhead, so we chose to cancel. If we had left sooner we would have been in the land where St. Patrick drove out all the snakes! Autumn Equinox occurred during most of our previous eight journeys to Ireland. Today is the Equinox, we are at home, and I’m thinking about the classic symbolism of Balance. When one is wounded in the foot balance can be a little off. This reminds me that on our first trip to Ireland, in September 2010, I broke my ankle. So, here’s the story of that fateful trip (pun noted) and the adventures that ensued. 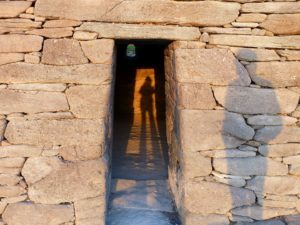 We had done tons of preparatory research and went armed to the teeth with brochures and maps, bird lists, and the names of holy wells and stone circles that we hoped to visit. It started out ordinary enough. From the Shannon airport we drove to the west coast and explored the amazingly beautiful tidepools at Kilkee. Large limpets and bands of blue mussels and pink barnacles patterned the rocks around pools of crystal clear water magnifying intricate lacy seaweeds, colorful periwinkles, orange starfish, and green anemones. Ascending the steep cliffs towards Loop Head we passed fishermen lined up on the harrowing cliff edges below and rows of dedicated birders on top huddled under colorful tent-like windbreaks with their birding scopes trained on the great seabird migration and, hopefully, the passage of whales. Stopping to talk to them, we were treated to an enthusiastic lesson on how to recognize kittiwakes and shags and fulmars. The next day we explored the colorful countryside, passing through many small villages of brightly painted houses and admiring the tall purple, orange, and white wildflowers along the roadsides. We learned to carefully negotiate the roads, most just wide enough for one car, with stone walls on both sides hidden behind vegetation and ditches at the foot of those walls. There were cows everywhere. We saw a number of signs warning DANGEROUS COWS CROSSING. On almost every road there was a farmer taking some ancient piece of equipment out for a slow ride. Somehow we had to pass each other. Inching past a giant machine with huge Ferris-like wheels in the air, rakes hanging all around them like flags, we almost missed a sign for a Saint Kieran’s Well. Our first Holy Well! 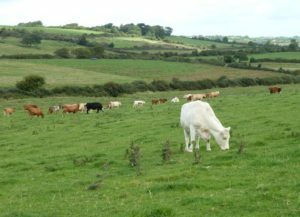 We found a small space to pull over, and after disarming the electric fence, we made our way across wide green fields full of cows, including the White Cow Goddess herself, hoping that one of them was not a bull. Arriving at the white wall that surrounds the well, we discovered that the gate was locked. Undeterred, my husband hoisted me up the wall and I descended onto a plastic chair waiting there like one of the faithful. Dripping the healing water through my fingers I prayed for the recovery of a friend back home and, while I was at it, for the healing of all our fresh waters. Later we took the Tarbert Ferry across the Shannon, the largest river in Ireland, on our way to the Dingle Peninsula. Back on land even the main roads were so narrow we hit the blackberry bushes on both sides. So we just stopped and ate our fill of ripe, juicy blackberries. Seemed like we could eat blackberries 24/7 and need nothing else. What a gift! Ascending the bare brown Slieve Mish Mountains, we came to a view that left me speechless. Spread out below us was a wide floodplain covered in a patchwork of chartreuse hedge-bordered fields reaching all the way to the dazzling blue Bay of Tralee. 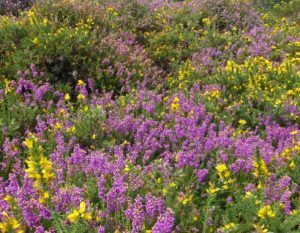 Stopping to bask in this beauty we could now see that the vegetation around us on the mountain was a filigree of bright yellow gorse and purple heather, complementary colors which from a distance blend into brown. Arriving in Dingle Town we met Veronica and Tom, and got situated in their 1851 stone farmhouse where we’d be staying for the first of our two weeks in Ireland. 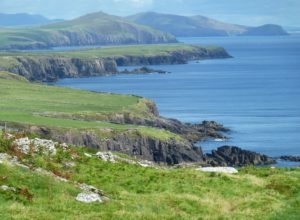 Day three, driving the Slea Head road along the ocean we saw that sheep had replaced cows here on Dingle and were frolicking perilously close to the edges of the steep cliffs. The way you can tell the difference between a sheep and a rock up on the hillside: the larger white things you see are rocks; those tiny white things up there are sheep. All the signs were completely in Gaelic. We explored the curved beaches carved into the cliffs and some of the early Christian sites that dot the hillsides overlooking the ocean, arriving at the 6th century Gallarus Oratory just as the sun was setting over Sybil Head and Smerwick Harbor, illuminating the doorway of the small, meticulously crafted, dry-stone chapel in a rosy glow. On day four we drove over the impossibly winding and skinny Connor Pass road. 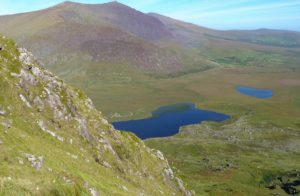 On one side the beautiful wide valley descends to Dingle Bay, and on the other the rocky hillside of sacred Mt Brandon rises. Hiking a ways up Ireland’s second highest mountain, reaching up into the expansive sky, we began to feel the spiritual power of this place. Continuing down Connor Pass we cleared an approaching car only by both slowly moving forward inch by inch. Arriving at Brandon Point on the ocean we parked the car and climbed up the Dingle Way, stopping at a high ledge that afforded a view of soaring seabirds below. We identified fulmars and choughs, talkative cliff-dwelling black birds with bright red beaks and legs. Brilliant white gannets were circling the wide, flat expanse of the ocean. Hiking back down to the beach at Brandon Bay we saw a dozen oystercatchers, a grey heron and a little white egret catching dinner at the water’s edge. 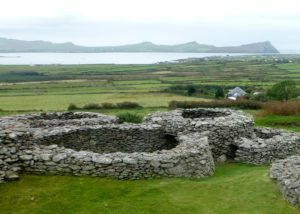 On our fifth day we were driving around the gorgeous Dingle peninsula when we came upon the remains of ancient stone beehive huts grouped together. These were the homesteads of the late Celtic / Early Christian period called ringforts. I was so proud that we had found something all by ourselves that wasn’t on a map! Making our way through the tall grass, exploring the stone structures, I stepped sideways on a hidden rock, twisting my ankle with an audible pop. Pride indeed cameth before a fall. At the Dingle Medical Center, the doctor, Eugene, told us the Dingle peninsula didn’t have any equipment for taking X-rays. Nor did he have anything to set the plaster or the protective boot that he would have wanted to put on. He confided to us that with the recession people’s health care is suffering. Fiona, the nurse, had wheeled me out on the sidewalk where we were waiting for David to drive up. Pulling into the curb he sideswiped a car. “That’s my car,” she said calmly. Laying a hand on my shoulder, she leaned down and said, “Your day just went from bad to worse!” That’s when I finally lost my composure. I knew she meant it kindly, though, and, in fact, the subsequent insurance negotiations proceeded smoothly and easily. David drove us to Tralee General Hospital, about 45 min away. Waiting there along with the other men, women and children, I was beginning to feel like an Irish resident myself. The technician who set the plaster did an efficient, skillful job. We were told that we should come back in a few days to get the break re-X-rayed so they could see whether they needed to operate. But when we tried to make the appointment, we couldn’t get seen for another week. That put all our plans askew and we knew we had to start calling and cancelling things. Back at the house, Veronica came over later in the evening and told us that her mother had broken her foot in Amsterdam and continued her trip, getting pushed around in a wheelchair. Veronica, it turns out, is a nurse at an old folks home, which is called the Dingle Hospital. She said we could go there and ask to borrow a wheelchair, telling them that she would vouch for us. She happened to know that if we decided to continue on in Ireland there would be a “hospital” in Kenmare and probably one in Doolin, too. She offered to call ahead to the B&B owners, asking them to borrow wheelchairs for us. When we told her it had happened at a ringfort she informed us that people believe that after their defeat by the Milesians the Tuatha De Dannan, the people of the Goddess Danu, went underground in the many ruined forts and mounds scattered around Ireland and became the Fairy Folk. Fear to offend the Fairies has saved many a ringfort from destruction. The Good People, they are called. Veronica herself seems like she might be related to them. We spent the rest of the day trying to make arrangements, some to see about flying home, some to see about continuing on. We went to the library to use the computer, and I had a little adventure riding up to the second floor in a tiny outdoor lift barely big enough for the wheelchair. Veronica told us this lift was just added the previous year. Seemed more like something to cart boxes of books up in. Disability concessions were non-existent on Dingle (except, we were happy to discover, in the wonderful brand new Blasket Island Center). The accident put a serious dent on our plans to experience the Dingle traditional music scene. We never approached a door that someone didn’t jump to open, but there’s no room in crowded pubs at night for a wheelchair, let alone for maneuvering it back to the loo after a couple of pints. So, we spent our evenings watching the sun set over the harbor and night descend on the mountains beyond. The afternoon of day seven we decided to see how it felt to move around on crutches and in the wheelchair, to help us determine whether to continue the trip. We tried to visit Kilmalkedar, a 12th century Romanesque church, but the wall around it was non-negotiable. I enjoyed sitting outside looking in at the old, primitive looking, slabby stone crosses that reminded me of goddess figures while David explored the church and grounds. Then we went to the 6th century Reask monastery. 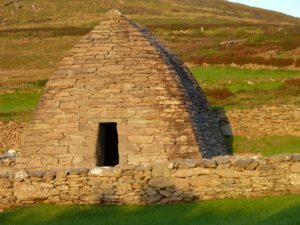 I was able to scoot on my bottom over the low stone wall and get pushed around by wheelchair on the grass so that we could see the remains of the clochans (beehive huts), the oratory, and the graceful arabesques of the crosses carved on the standing stones. We began to think that this method of travel might actually work. Still unsure, before falling asleep I asked for a gentle sign about whether we should go back home. I awoke from a vivid dream of whales leaping forward on their tails. The life-filled energy of their forward movement seemed to be a sign to continue on. Later we found out that some minke whales had just been sighted. To honor the dream and the whales I drew them on one of those postcards we would send saying what a good time we were having. 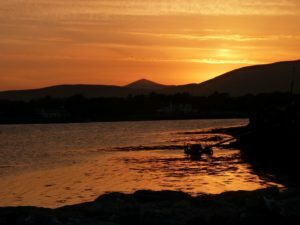 The proximity of ocean and mountains felt so healing I couldn’t imagine a place where I would rather spend my time recuperating than the west of Ireland. My wonderful chauffer and nurse said he was willing to drive Miss Daisy around. We were forced to slow down, and that was a good thing. I think I was tripped up by the Fairies so that we’d get to know the Irish people better and also so we would quickly become non-ordinary tourists. The beginning of our second week we prepared to continue south to Kenmare. As we began to pull away from our pretty stone farmhouse, Veronica leaned in the car window and said, “You have a good man there.” I agree. We were allowed to drive through the beautiful Gap of Dunloe. Normally tourists are persuaded to ride through it on a horse-drawn jaunting car, which would have been daunting. Once through the Gap we climbed above the Black Valley and looked back on a very impressive view of the McGillycuddy Reeks, where Ireland’s highest mountain is located. 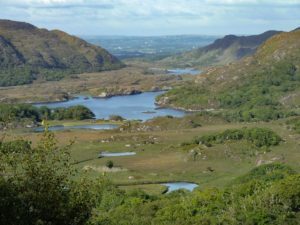 From there we continued up to Moll’s Gap on the long and winding one-lane road that snakes towards Killarney National Park. There we had the famous Ladies View over the lakes completely to ourselves. When we arrived at our Kenmare B&B, Brandon, our host, sure enough, had a wheelchair waiting. 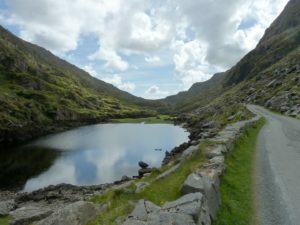 This was our day to drive the highly touted Ring of Kerry around the Iveragh Peninsula. After driving for a while, we spotted a small sign and decided to look for a holy well. We ascended a steep hill on a skinny little road, more like a driveway, that wound around amongst houses, which was an interesting, intimate way to see how people live up there in the hills, but we missed the well. We didn’t realize we’d missed the well, so we kept going. It had started to rain. Finally we turned around and began driving back down. David said, “Where the hell’s the well?” and that jinxed us, I’m sure. I spotted a bench, so we made another multi-point turn and drove back up the hill until we came to a small white gate with a cross on it. Looking down we could see that it was completely inaccessible by wheelchair. At this point the steep hill was slick with rain and we couldn’t get traction, so the only way we could get out was by backing down the narrow curve. We went into the ditch and got stuck, couldn’t get out. Just then a young woman, out for a walk in the rain, knocked on the window and asked, “Do you need a pull out? My uncle is a garage man and can do that. Do you want me to go get him?” Naturally we said yes, please. We waited and waited. I’m in the back seat with my leg up on the console. I’m plastered against the window and the window is plastered against the vegetated wall. David is sitting at the wheel in the position of someone about to go up in a space ship. Suddenly we heard a very strange, loud chug-chug-chug coming up behind us from an ancient piece of machinery with a giant funnel on it. A man got out, checked the ground, eyeballing the spacing, got back in and somehow made it past us. Then stopped. This was our garage man! He got out, attached something like a flattened fire hose under the front and pulled us out. Wouldn’t take a euro for it. Lord knows what he was thinking about us. We continued on the Skellig Ring, a one-lane road with straight up bushes on both sides. No doubt there was a ditch hidden along there too. It was raining harder. We could see virtually nothing. If we could have seen something other than gray we would probably have been oohing and aahing. After all, this was the famous Ring of Kerry. We made it to Portmagee at the ocean end of the peninsula and stopped at a nice looking, small white-washed stone building with bright red window trim that proudly displayed a plaque saying that it had won the Top Toilet Award. David went inside and emerged saying that the award must have been for the outside. 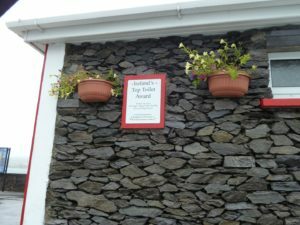 We had seen a couple of award winning Tidy Towns before, Kenmare being one of them, but this was our first Tidy Towns Toilet! Across the street the Bridge Pub was also colorfully painted. Inside, the place was packed with locals watching a big screen with a very strange and incredibly intense game that I guessed correctly was Hurling, an ancient game unique to Ireland. We quickly realized that all of us in the pub were rooting for Tipperary versus Kilkenny. Turned out this was the All-Ireland Hurling Finals. We lingered over our seafood chowder and the best brown bread yet, fascinated. Back in Kenmare Brandon told us there would be a replay of it in Gaelic, so we watched, feeling like we were in the stadium with the other 80,000 cheering Irish people. 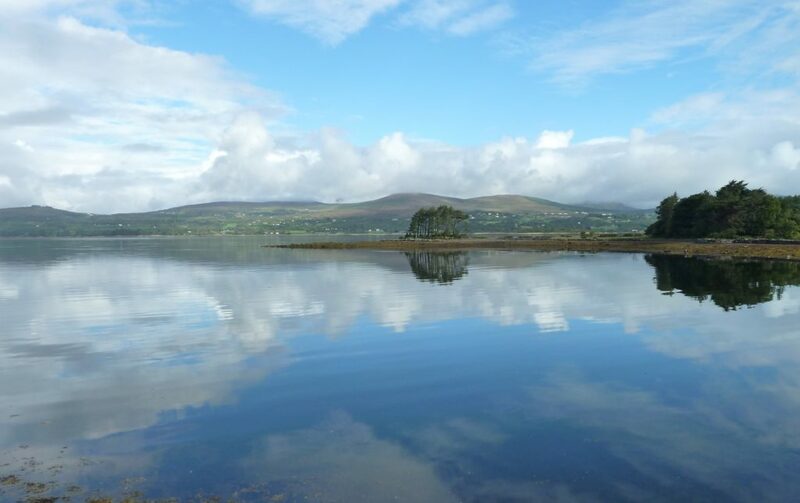 On this morning the weather was calm and sparkly, the wide Kenmare River estuary looking like a glassy sheet. We began our tour of the Beara Peninsula stopping first at Gleninchaquin, a park that Brandon had told us about. 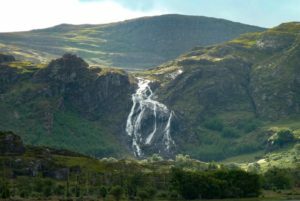 Gleninchaquin Falls is a 500ft. cascade in the most beautiful mountain setting I have ever seen. It’s as if every rock grouping is a sculpture and every rock has a garden of grasses, ferns and wildflowers on it. 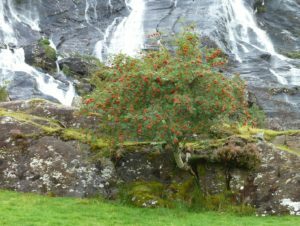 At the base of the falls there is a rowan tree chock-full of red berries, a quintessential sign of autumn. The rowan is said to be sacred to the Fairies, a tree of protection and healing. I took that as an auspicious sign. We went on to visit the Ardgroom Stone Circle, constructed about 2,000 BC. Arriving at a small dirt parking area I surveyed the distant circle through my binoculars and reported, “There’s a black cow that appears to be standing in the middle of the circle.” While David made his way over the rough boggy ground to the circle I leaned on the car door, continuing to look at Ardgroom through my binoculars, trying to imagine being there. A group passed by, and the man at the end of the line told me that he does tours, Wolfhound Tours. Seeing my cast he related a story about an accident he had had up on Crough Patrick three weeks before. A woman in his group was very frightened and afraid of falling. He lost his attention and fell himself, sprained his ankle, and was just now feeling better. “They say when you hurt your ankle it’s never quite the same, that you feel the pain, it reminds you that it is vulnerable and could happen again.” Thanks a lot. 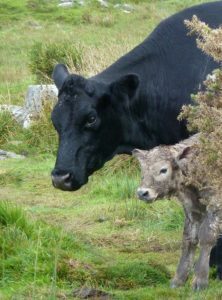 When David got back he told me that at one of the standing stones, the black cow had just given birth to a calf and was licking it clean, mooing softly, and watching him very carefully as he approached, giving it a wide birth. After some moments the calf stood up and started suckling, drinking milk for the first time as the mother continued licking it. He said he felt a sense of awe in this very powerful circle. 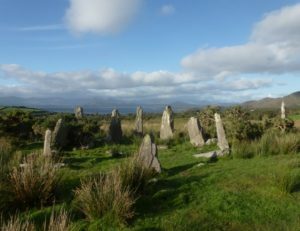 Early the next morning we went to the lovely, wheelchair friendly, Kenmare Stone Circle. We were able to spend a long quiet time there by ourselves. Like the circle at Ardgroom, it’s on top of a hill, a small round hill with a valley all around, and mountains all around that. Unlike Ardgroom this circle is not in a wild place. It’s in a respectfully planted and manicured setting, but the stones themselves felt very powerful, each having a different character. The central boulder burial is large and imposing. We circled slowly, first clockwise, then counterclockwise, laying hands on each stone. I prayed for our children, two sick friends, and for my Irish grandmother. One of the stones felt almost like an altar. I placed five pebbles in a cleft in the rock as a little offering of beauty. And I said a prayer for my bone and for the stone bones of the Earth, that the relationship between us might be healed. 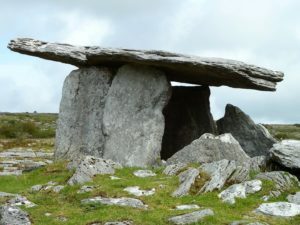 Arriving in the Burren we explored the surreal limestone landscape, stopping at the iconic 3,500 BC Poulnabrone Portal Dolmen. 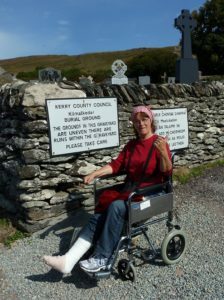 We stayed in Doolin, where again there was a wheelchair ready and waiting. On our last day, at the Cliffs of Moher, a Ranger named Cormac helped push the wheelchair up the long hill and stood with us up there on the cliffs for a long time helping us identify birds, pointing out the two peregrine falcons out there on the sea stack, and waiting patiently to answer any questions, himself acting like a benevolent Irish Fairy. At Liscannor, on our last stop of the trip, a sweet moment occurred. We had gone in the wrong entrance and made a circuitous pilgrimage of sorts up the hilly path in the wheelchair and then back down the steps (me on my behind) to St. Brigid’s Holy Well. 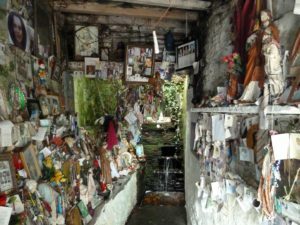 I was in the cramped passageway of the cave-like structure praying at the dripping well stream, David standing behind me, when one of the local women, who obviously helps tend the shrine with its hundreds of photos, mementos, offerings and statues, rushed in. She said, “Don’t go, I’ll just be a minute.” Squeezing past us, she took some fresh candles out of her shopping bag, lit them in the alcove where there had been only one guttering candle. She bent to the well, turned and sprinkled us with the holy water saying, “God and Brigid be with you,” as she squeezed her way back out. I was grateful to receive this lovely parting benediction. At the Shannon airport several attendants were very helpful pushing the wheelchair for us, but of course the Irish one was the best, sweet, funny, and kind! 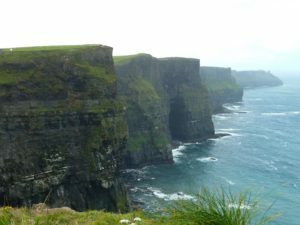 We had experienced the great, natural, at-ease friendliness of the Irish throughout the trip, and once again tears came to my eyes at being treated with such compassion. Back home recuperating, I was sitting with my leg up reading a book by Tom Cowan called Fire in the Head: Shamanism and the Celtic Spirit when I came to a part that opened my eyes wide. In a section called The Wounded Foot he describes “one-footedness . . . an inability to walk due to a wound in the foot, leg or thigh” as indicating contact with the Otherworld or with Otherworldly allies. St. Patrick didn’t drive snakes out of Ireland. (There never were any because of the glaciers.) What he drove out were the Druids, the Celtic version of shamans. They were said to chant their incantations while making gestures such as standing on one leg and keeping one eye closed. Perhaps by becoming non-ordinary in their bodies they had been able to move easily into non-ordinary reality. The old Druids may be gone from Ireland, but the presence of the Otherworld remains tangible, as if the Irish people still dwell very close to it. Indeed, there is an Irish saying, “Heaven and Earth are only three feet apart, but in thin places that distance is even shorter.” I wrote in my journal that the broken ankle was a talisman to remind me that I was wounded by the Good People of the Otherworld so I would remember to walk in a sacred manner, with awareness that the spirit world is close, right here on Earth. Hmmm, maybe this is a shamanic story. 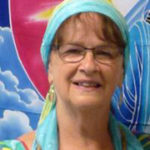 Cowan says, “As a storyteller, the shaman leads listeners back into the primordial chaos. . . to where the original unity existed.” Here the listener gets “a glimpse of the supernatural state in which opposites are reconciled and the anguish of life can be alleviated by magic.” I’ve noticed that every time someone asks, “How did you break your ankle?” and I reply, “On our trip to Ireland,” they uniformly say, “Oh no, how awful!” and react to it as a disaster, empathizing that it must have been horrible and ruined our trip. I’m always surprised at the intense vehemence with which they, even meditators, exclaim, “That’s terrible!” When I tell them how the Fairies tripped me up, how the Irish people cared for us, and how we had a brilliant time, you can see the imagined chaos receding, replaced by wonder and the world of possibilities opening up right before their eyes. The unfolding of events on that fateful trip certainly had a magical quality. For a moment we glimpse that magic together. “Well, you’ll never forget Ireland,” my friends conclude. Yes, I am bound to Ireland in body as well as in soul, to the rocks, to the land, to the people. My bone got broken on the bones of the ancient, primordial earth in that enclosure deemed sacred, still inhabited by spirits, that place where no rocks have been allowed to be removed in order to remain in the good graces of the Good People. Back home, I wish we could heed some such taboo that reminds us to treat the Earth with respect so we can remain in her abundant benevolence. Here I am on the Fall Equinox eight years later, one-footed again. Physically unbalanced, I come into emotional balance by gratefully remembering the kindness of Ireland, the human people and the Fairy Folk. I guess I needed another reminder (don’t we all?) to walk with reverence upon this sacred, spirit-filled Earth. Together, right now, let’s vividly imagine the possibility that we can step back from the brink of chaos and learn to balance our human needs with the needs of the rest of our companions in this community of Life. Text © 2018 Betty Lou Chaika. Photos © 2018 Betty Lou and David Chaika. Lovely images and rendering of the journey. Did you know there is also a Briged’s Well on the Isle of Iona in Scotland? Thanks, Sharon, for your kind response. Do you mean the Well of Youth up on Dun I? If so, yes, I return to this lovely spot in meditation when I hold an egg shaped rock we brought back with us. It takes me right there. What an interesting story and perspective. Awww. . . . Fairies . . .
Glad you enjoyed it, Ann. I later came to understand that “fairy” is actually an English name for them and rather diminishes them to cute little things. They are not! In Gaelic they are the Aos Si, the People of the Mounds. The older spelling of Si is Sidhe (pronounced Shee). They are inhabitants of the Otherworld, a parallel reality that interacts with this one. I serendipitously read this today with my knee mysteriously whacked and painful. Perhaps now with your story I can better remember I am meant to walk with even more reverence upon the earth and with her inhabitants,and with myself as well! Yes, Robin, I think when we remember that we are sacred beings walking on sacred earth we include ourselves, right here with all the other sacred beings, so that there is not a separation between us and “them.” Let’s help remind each other. Betty Lou, another beautifully written piece! The memories and descriptions of your experience, the wild but endearing landscape of this ancient land, and its kind, open, and gracious people were folded so well into this shamanic tale. How like the Fairies to trip you up, slow you down, remind you of the joy and wonder to be found in the simplest of things. Ah, Margot, yes, you know and describe well that “wild but endearing landscape” and those “open and gracious people.” I’m grateful to have shared this magical Place with you in person as well as in print. Betty Lou, another gripping tale of engagement and magic form the process of intersecting and intersticing yourselves into the landscape, the legends, and the bioliths of wondrous Ireland! The photos are very nourishing and the tale was well told and very alluring. I feel graced and blessed having read it, almost participating the mysteries and adventures you experienced in the land of the Tuatha de Danaan. What a blessing a calamity can be! Laurie, I can tell from your response that you did let your fertile imagination participate in the mysteries. And out of your imaginal journey came two wonderful words. May we all practice intersticing ourselves in the web of Earth-Spirit Life all around us. From now on, when I am thanking Earth for the rocks that hold the memories and stories of our ancestors, I will always remember to thank these bioliths! Thank you for gifting me with these lovely vocables. Remembering you fondly from our times moving together. It is a pleasure to read of your travels, both exteriorly, and interiorly. It is always interesting to ruminate on one’s injuries- where and how they happen. I have a *little voice* who tries to warn me when I’m about to do something… out of balance, or just plain stupid. It usually whispers the first time and I have to be really listening to hear it. Always a gentle warning. The voice has saved my life a few times, and of course I’ve not heard it in time, too! Hi Patrick, great to hear from you! Thanks for your encouraging words. Yes, a group of us are still doing Authentic Movement monthly. I think the “little voice” of intuition’s wisdom can sometimes be challenging to discern. For example, I had a premonition about the presence of a copperhead and took precautions that may have prevented those who attended an outdoor party at our house the previous night from getting bitten. The intuition was revealed to be true. When the snake bit me, we took it as a warning not to go to Ireland. But since we didn’t go, we will never know if the intuition of something worse happening was true or not. Interesting! I’m sure glad the voice of intuition saved your life! Jill, I want to thank you for all your support and encouragement of my writing. It is a lonely task, but knowing you are out there helps me have the sense of connection that all writers hope for. I’m so grateful to be sharing love for this beautiful, ensouled world with you, my friend.